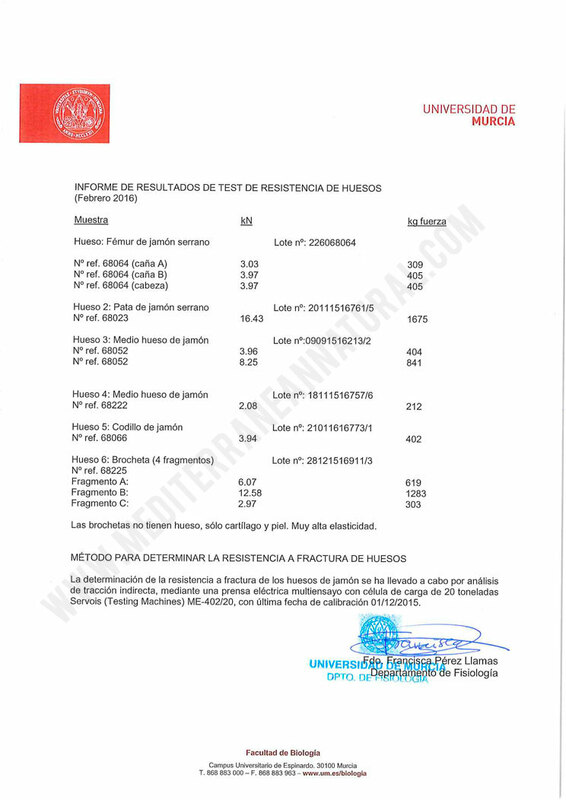 In our effort to offer our customers top quality products, we have carried out a study, in collaboration with the University of Murcia, in order to check if our Ham Bones are sufficiently resistant and safe to the breakage and the splintering caused by the Pressure exerted by the jaw of a dog on the bite. 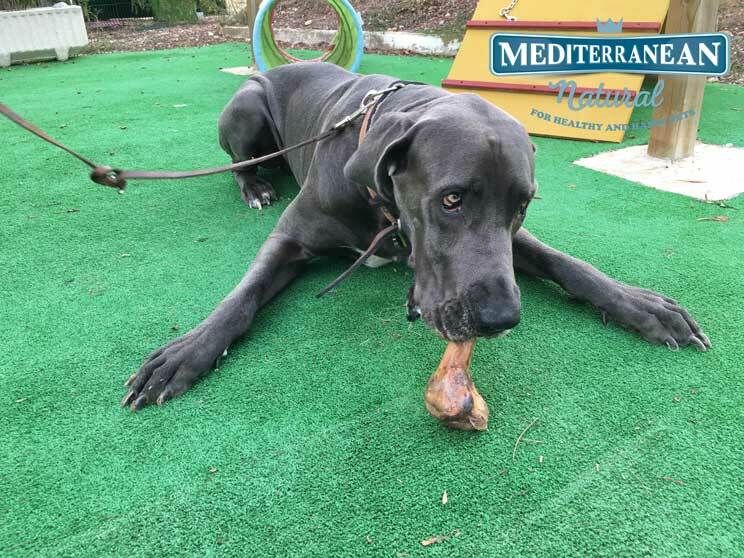 A great Dane, corpulent dog, enjoying his Ham Bone Mediterranean Natural. 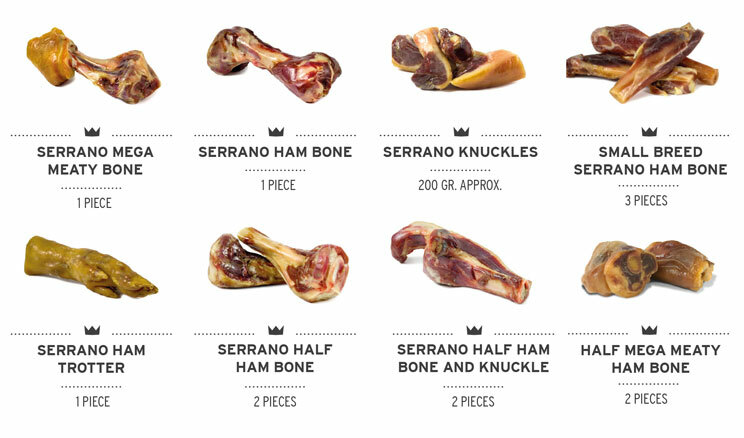 For the manufactured of Ham Bones, Mediterranean Natural selects serrano ham bones of Spanish origin. Our suppliers are important and recognized professionals in the human food sector. We visit them regularly and there is a constant and fluid communication that allows a comprehensive quality control over the raw material. In addition, during the manufacturing process, we pursue at all times to get a natural, nutritious and safe product. The problem of consuming other type of bones is they could be easily splintered when the dog bites them and, if you swallow some of these small pieces, there is a possibility that they may damage your digestive system. Based on the fact that the risk of splintering always exists, in Mediterranean Natural we have worked for months on this aspect and, thanks to our production system, we have achieved to minimize the splintering risk. 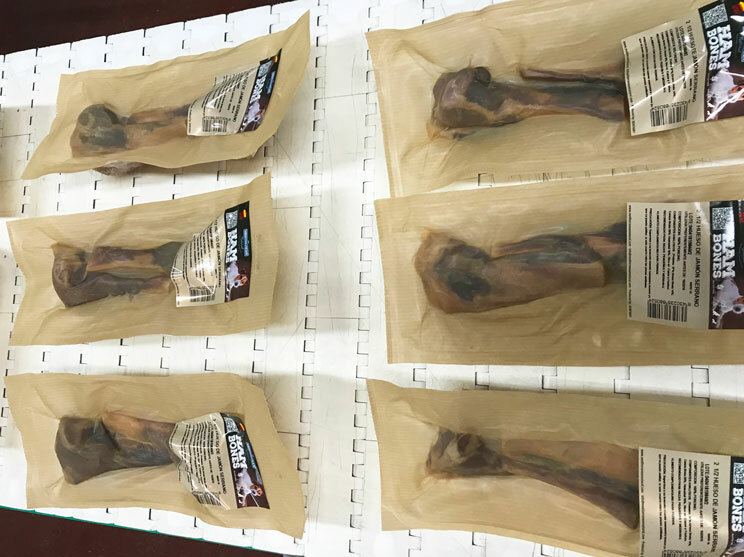 In the image, Ham Bones of Mediterranean Natural after its vacuum packaging. Mediterranean Natural bones do not boil, thus avoiding their softening, and are less vulnerable than other bones to splintering. In addition, they undergo a drying process, which does not destroy their nutrients, so that our products retain all their nutritional properties intact. In the review of the scientific literature by Picó Peris (2007), it is described that the bite force is conditioned by the dog’s race, size, age, gender and cranial morphology. This same author concludes that, by selecting a large group of large dogs with powerful heads, maximum numbers of 200 to 250 kg force are obtained in the bite; If you also consider the preparation capacity (training of the dog to increase his aptitude), maximum figures can be obtained around 300 kg force. This means that dogs with the strongest jaws could exert a force on the bone of between 200 and 250 kg force and, if they train this ability, would reach up to 300 kg force. 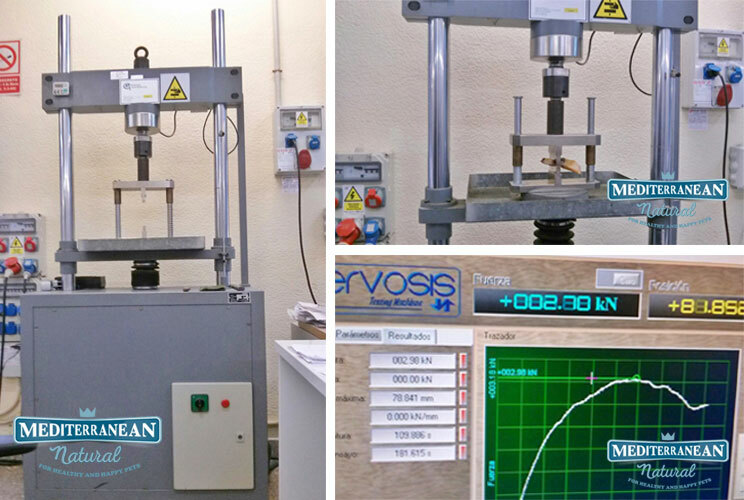 In the image, different moments of the resistance study of serrano Ham Bones done by the University of Murcia with a multitest electric press. The strength of the bite or bite of a dog (and other animals in general) is measured by the pressure exerted by the jaw when closing to bite. 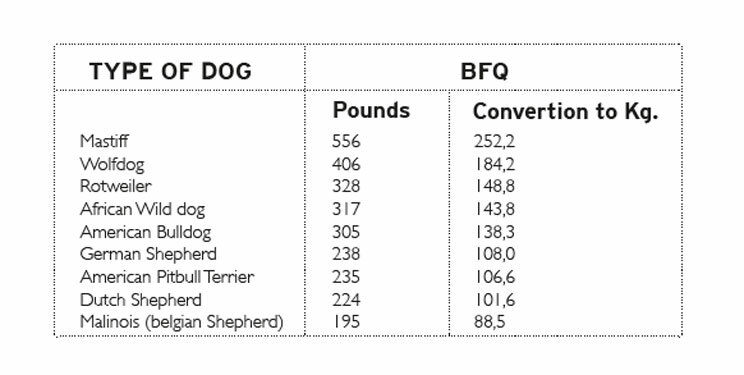 The most used meter is the BFQ (Bite Force Quotient), a quotient that measures the strength of the bite in relation to the weight of the animal. Even so, the motivation and emotion that at a given moment is imprinted on an action, can multiply its strength, and that motivation is difficult to achieve in the studies. 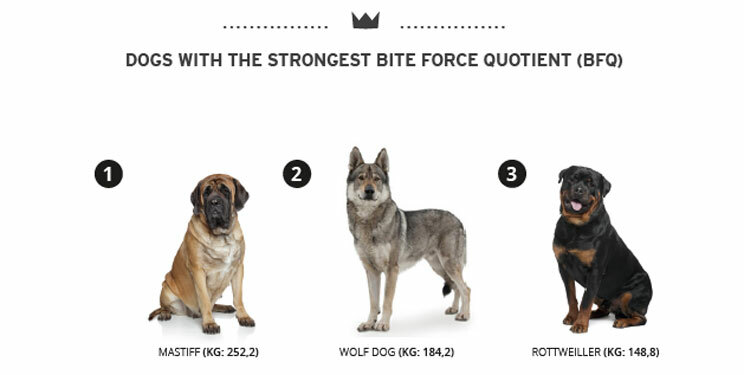 In the ranking of highest to least bite force according to a National Geographic study, the MASTÍN is in first place, followed by the WOLF DOG, and in third place the ROTWEILER. 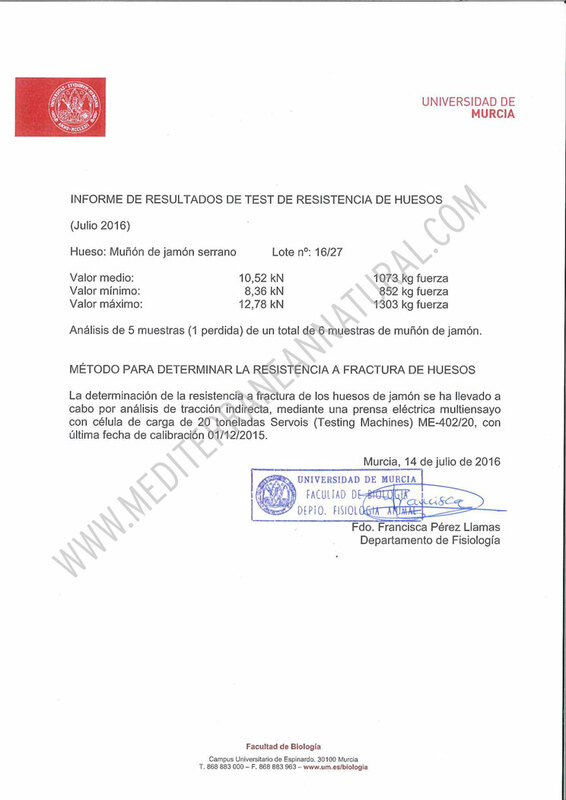 Therefore, according to the results of the inform certified by the University of Murcia, analyzing the results of scientific studies and according to our recommendations (on our website and on the product, where we indicate the adequacy of each ham bone variety for dogs depending on its size) we can conclude that the Ham Bones of Mediterranean Natural are a safe product for pets, provided they are administered under these recommendations. 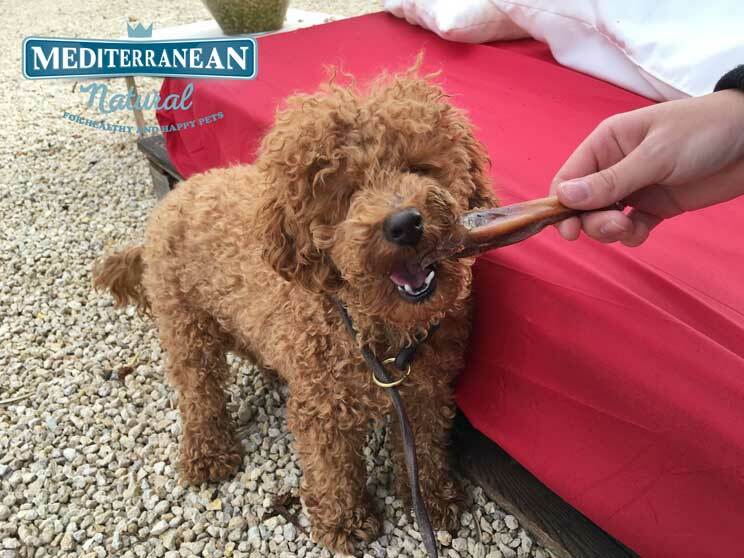 Smaller dog, such as the Toy Poodle, can also enjoy the Mediterranean Natural Ham Bones. For them the small Ham Bone is a good choice. In any case, remember that ham bones are a natural product that should always be given to the dog under the supervision of an adult and remove the small pieces that the animal can swallow in the event of a fracture. A dog should never be given a bone smaller than its mouth. 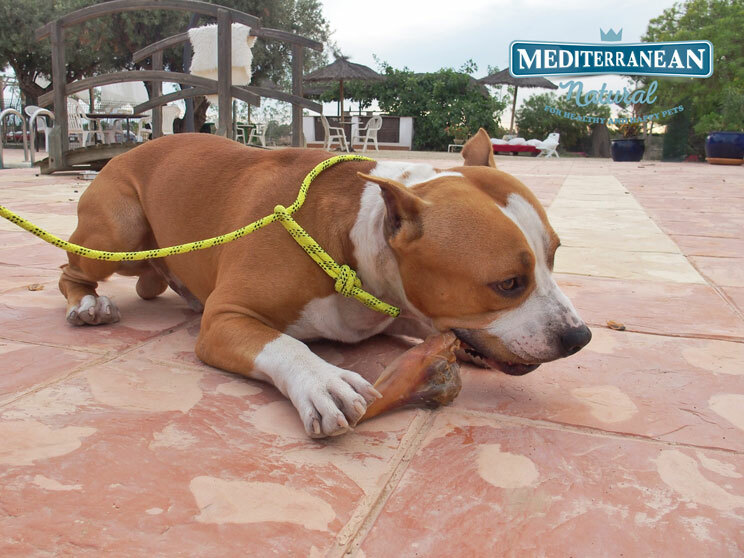 In Mediterranean Natural we offer a wide range of Ham Bones suitable for dogs of different sizes: half mega meaty ham bone, serrano mega meaty ham bone, serrano ham bone, serrano ham knuckles, serrano mini ham bone, serrano ham trotter, ½ serrano ham bone (1 and 2 pc). If you want to buy our Ham Bones or sell them at your specialized store, click here to our online shop. To find out about shops near your home where to find Mediterranean Natural Ham Bones, send us your postal code to marketing@mediterraneannatural.com and we will reply you as soon as possible. Thank you!